Would you take an untried and unfamiliar Royal Enfield on a cross-country trip? Buy a motorcycle and ride it more than 400 miles home in one day. That's the challenge a Colorado man set himself after purchasing a 2017 Royal Enfield Classic Chrome from Indian Motorcycles in Sturgis, S.D. "Radare" (his user name; his real name is Robert) wrote up his experience for the Adventure Rider blog. It's even more remarkable, given that he had never ridden or owned a Royal Enfield prior to this trip. I'm also a little stunned at the price he reported paying for his near new Royal Enfield, with only 2,000 miles showing on the odometer. It's significantly less than I paid for my 1999 Royal Enfield Bullet in 2001. What a deal! 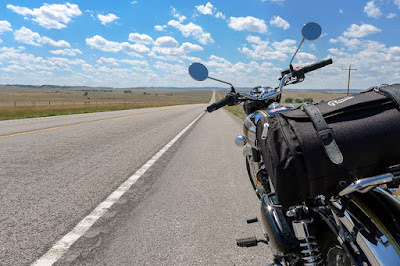 The journey took him through the Black Hills of South Dakota, a route perfectly suited to the Royal Enfield. Motorcycle and rider conquered O'Neil Pass, elevation 6,683 feet. The (presumably) downhill stretch after that had Robert reporting almost unbelievable gas mileage. "With a 70 mph limit on U.S. Highway 85, you get the tourists blowing through at 80, 85 or even 90 mph in some areas. I spent much of this section of U.S. 85 being passed by cars, trucks, trailers, RVs and, I even think, a bicycle. Drivers here were good about not tailgating and using passing lanes. I never did have a complaint about how I was treated in traffic, though this leg was not my favorite part of the journey." As the day dragged on, temperatures went up. The motorcycle "didn't seem to notice," but the rider did, stopping to drink and splash water on himself. It wasn't a perfect trip. The Royal Enfield shook out some bolts, nearly losing the exhaust heat shield and boot guard. But Robert reports that it "ran flawlessly" on the trip. It left him looking forward to new adventures on his Royal Enfield. "It put a smile on my face and a love of riding in my heart that I haven't felt in a long while." That's what riding a traditional big single in the manner at whioh it is most happy can do to you. Put a smile on your face!